When I first saw this book by Sarwat Chadda, it was published in the UK under the title Ash Mistry and The Savage Fortress. The plot offered me a front seat trip to India plus action and adventure; I’d never say no to that. But I had to wait for the US to get its act together and finally offer this book in its proper hardcover book format. 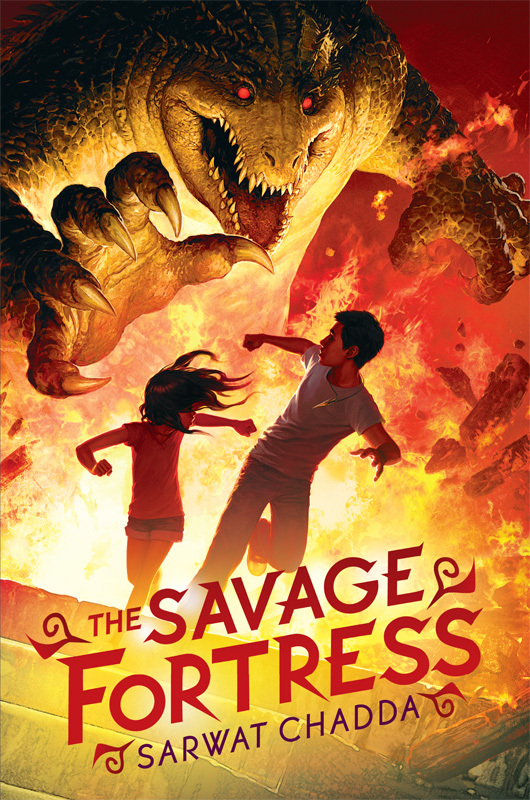 Of course by the time the book got to the US the title was changed to The Savage Fortress and I hoped that was the only thing that was changed. Yes, I’d have settled for e-book but I really wanted this particular one in hardcover. Finally, I cracked this baby open and boy was I in for the wildest ride of my reading life. Thirteen year old Ashoka Mistry, named after an Indian god no less, got his dream – to visit India. Of course his younger sister Lakshmi, whom everyone calls Lucky, tags along. In true budding teenager form, Ash, as he is known to family and friends, is the typical snarky, opinionated, I-want-what-I-want-when-I-want-it teenager. But he is matched word for word by his sassy sister Lucky who puts up with no rubbish from him. Immediately, the reader is shown that underneath all the back and forth bickering and snark between Ash and Lucky (he calls her Lucks), you see siblings that are super close and an adherence to proper Indian upbringing and culture that says that as the oldest child, you are responsible for your younger siblings; a responsibility Ash takes very, very seriously almost to his detriment. But this trip to visit his Uncle Vik and Aunt Anita in the furnace-hot, congested India wasn’t to be a typical one. Ash is into all things Indian mythology, especially The Ramayana and he’s hoping that his Uncle Vik, a scholar of ancient Indian history, will give him some fascinating insights on India’s rich culture and mythology. But when Uncle Vik is hired by the mysterious Lord Alexander Savage for an exorbitant sum of money, Ash is immediately troubled. On a picnic with his Uncle and Aunt near Savage’s home, Ash and Lucks go snooping and find an unmanned excavation site. Curiosity gets the better of Ash and he soon finds himself in the presence of a statue of Rama holding a bow and arrow. As the ground shifts beneath his feet, Ash tumbles and latches on to the statue’s aastra, arrow. But nothing will ever be the same after that when Ash realizes that the head of the aastra has broken off in his hand and what’s worse, his thumb hurts badly though there is no sign of a puncture wound. Who would’ve thought that this one mishap could cause the series of unfortunate events that suddenly befall Ash and Lucks? In one fell swoop, Uncle Vik and Aunt Anita are killed and Ash and Lucks are being hunted by ancient rakshasas, demons thought to be either non-existent or long extinct depending on whom you speak to. But on the other hand, Ash and Lucks find themselves being protected by a sidhu, a priest, and Parvati, a half-human, half-rakshasas girl, the daughter of Ramayama. In the midst of all this hurt and pain, Ash and Lucks must put away childish things, make hard choices, and somehow manage to keep themselves alive long enough to be able to get home to their parents who are in London. This is a coming of age story like I’d never read before. It was wonderful to be reading this book at a time when I’m re-acquainting myself with a part of my history and culture as a mixed-race individual. I’ve always studied Eastern History, China and Japan specifically, but hadn’t delved deeply into Indian culture and history until now. Recently, I was privileged to attend my first Diwali celebration, and the Mystic India dance theatre show. At last, I’m the proud owner of two beautiful South Indian silk saris, as well as three salwar kameez pants outfits and accessories. I’ve been enjoying getting to know the Indian part of my heritage. I love this book. I was even able to finish it in two days (darn sleep), a record for me. I like an author who is not afraid to write from his heart and soul. As a budding novelist, I appreciate that not every chapter was a long one; it was like allowing the reader to breathe, if only for a moment. Author Sarwat Chadda has knocked this one out of the park with a well written, fast paced, adrenaline filled story that never allows the reader to feel bored. He creates a nice balance between humor, heartbreak, and the difficult choices that we as humans must sometimes make no matter our age. With my inordinately active imagination in overdrive, I found myself going through a range of emotions and feeling compassion for unlikely characters like Parvati. This story is for the young and old alike, and is indeed a funny, gritty, thrilling heroic, roller coaster pager turner that left me breathless and at times in tears. I’m definitely looking forward to book 2. This entry was posted in Books and tagged action/adventure, DRAMA, Indian history and culture, ya. Bookmark the permalink.